Planning to renovate or remodel your home is such an exciting time for homeowners, but it can also feel overwhelming. There are so many decisions to be made, and then there is the matter of having to keep the rest of the home habitable while the work is underway. The team at Zippy Shell Greater Columbus would like to share some tips and ideas on how to make the most out of your next big project. In order to turn your renovation dreams into reality, you will need to rely on the services of professionals. Consider those pros as members of a team, with the shared goal of getting your project from concept to completion. A great place to begin is by selecting a general contractor to serve as the team leader. They can provide invaluable advice when it comes to many of the decisions that must be made throughout the project, and developing a good relationship with your contractor is essential. Be sure to share not only your ideas about the project but also the budget that is available. Your general contractor or project manager can suggest areas where cuts can be made if needed, and also give you advice on choosing between various materials and finishes. They will also serve as a central point of contact between all of the other pros that will be involved in the remodel, from the architect to the laborers. Before beginning any significant renovation, take an aggressive stance toward decluttering. Creating a new space within your home should serve as an inspiration to get rid of items that no longer meet your needs, have no purpose or fail to bring you joy. In addition to decluttering, consider putting your valuables into storage to protect them from loss or damage. Storing items of value gives homeowners the peace of mind that these belongings will be safely out of harm’s way, and ready to be reintroduced into the newly remodeled space once the project is finished. Zippy Shell Greater Columbus offers many different storage options, and we can even deliver a container right to your property for you to pack at your leisure. Once you are ready, we will transport the shell to our safe and climate-controlled storage facility. We take security very seriously, and you can rest assured that your valuables will be safely stored while on our property. When your project is complete, just let us know, and we will bring your belongings back for you to unpack. Take your time, and let us know when you are ready for the shell to be removed. 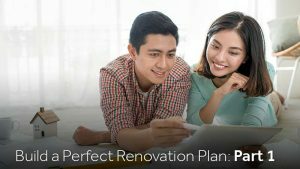 For more helpful tips on creating the renovation project of your dreams, be sure to check out Part 2 of our “Build a Perfect Renovation” series. 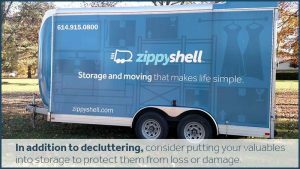 Contact us today at Zippy Shell Greater Columbus for more information about our storage services!